I have just returned from a weekend in Paris where I ate and ate and ate. I can still feel the red meat, cheese and wine coursing through my veins. My poor body is crying out for something green, something that crunches other than the crust of a baguette. But I’m choosing to ignore those cries for now. On the Eurostar home I was thinking about duck. I ate some delicious duck in Paris – both a confit and smoked in a salad. It was lovely but I am more convinced than ever that no one does duck justice like the Chinese. And after less than a week in Europe, I already find myself hankering after the Asian flavours waiting for me back in Thailand. China town is the place to go for a duck fix – they are hanging everywhere, spiced and slow cooked. In honour of my renewed conviction that this is the only style in which to cook duck, I have come up with this dish. It’s a modern day Asian-fusion twist on the eighties classic, duck a l’orange. The spices, the crispy skin, the little acidity in the sauce are a perfect marriage. This is awesome dinner party fare. If you’re going to make your own Chinese five spices rub, start with this. The recipe for this is the same as I used for an earlier tofu recipe. Then prepare the ingredients for your sauce. Very finely chop the onion and mince the ginger and garlic. Stir the corn flour into a little cold water to form a smooth paste. Next prepare your duck breasts. Score the skin of the duck breasts several times with a sharp knife, making sure you don’t cut into the flesh. Sprinkle over the Chinese five spice powder, and salt, then rub into the skin. Heat a little vegetable oil in a pan over a low-medium heat – duck contains lots of fat so you won’t need much. Place the duck skin-side down in the pan slowly fry for 10-12 minutes. Cooking the duck slowly for a while in this way will produce a lovely crispy skin. While the duck is cooking, prepare the sauce. Heat the sesame oil in a small saucepan and cook the onion until softened. Add the ginger, garlic and vinegar and sugar. Cook until the vinegar has almost cooked away. Stir in the star anise, soy sauce, stock and orange juice. Bring to the boil and then reduce to simmer. Add the corn flour paste and cook for about 8-10 minutes until the sauce has thickened slightly. Season with salt and pepper. Back to the duck - turn the breasts over and cook for a further 10 minutes or so. The cooking time will vary depending on the thickness of the duck you’re using and how pink you like it. It should still be a little pink in the middle but not bloody. Once the duck is done, remove it to the pan and leave it to rest. This will prevent the juices from spilling out onto the plates. While the duck is resting, keep the sauce warm and prepare some egg noodles according to packet instructions and steam some vegetables (I used broccoli and mushrooms). To serve, carve the duck into thick strips and carefully place the slices on a layer of noodles, with one star anise on top. Place the vegetables around the duck and then gently pour the sauce over the plate. Cooking ahead? You can prepare the duck breast in advance and leave them in the fridge with the spices already rubbed in. The sauce can be made the day before and reheated. Love your recipe and presentation! !Chinese five spice rub sounds delicious!Have to try it for sure :)Great job!! Gorgeous presentation! I'm so jealous of your Paris adventures...can't wait to get back there whenever that might be! Gosh, I am salivating here. How delicious your meal looks! Wish I can have some right away. thanks so much for sharing. What a great meal. I love duck and only few days ago i made whole duck. I have to try your recipe with ginger soon. 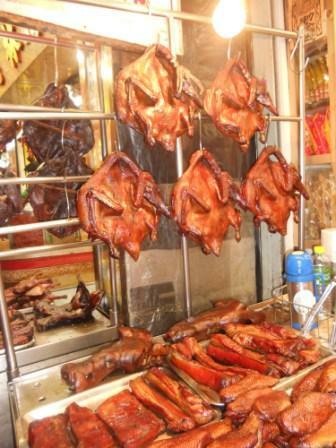 Chinese roast duck is my favourite Chinese dish. The meat is flavoursome and moist. I guess that to marinade the duck breast prevent the meat drying out.